A small oval bronze marker is attached to a steel post standing two feet high. It is one of at least eight in a series of markers that form a walking tour about High Point citizens. 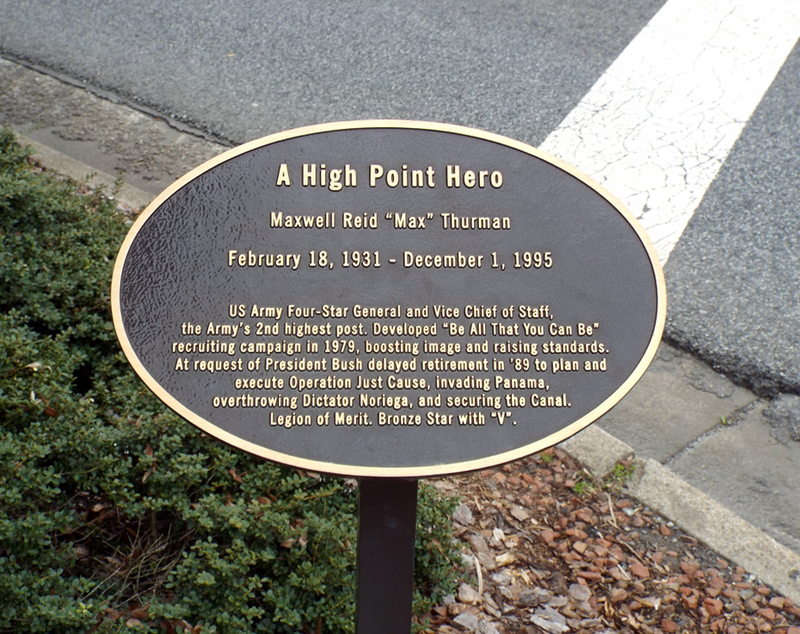 A HIGH POINT HERO / MAXWELL REID “MAX” THURMAN / FEBRUARY 18, 1931 – DECEMBER 1, 1995 / US ARMY FOUR-STAR GENERAL AND VICE CHIEF OF STAFF, / THE ARMY’S SECOND HIGHEST POST. DEVELOPED “ALL THAT YOU CAN BE” / RECRUITING CAMPAIGN IN 1979, BOOSTING IMAGE AND RAISING STANDARDS. / AT THE REQUEST OF PRESIDENT BUSH DELAYED RETIREMENT IN ’89 TO PLAN AND / EXECUTE OPERATION JUST CAUSE, INVADING PANAMA, / OVERTHROWING DICTATOR NORIEGA, AND SECURING THE CANAL. / LEGION OF MERIT. BRONZE STAR WITH “V”. The General Thurman plaque and seven others were first presented to the public on August 30, 2010 at the Mendenhall Transportation Terminal in High Point. They were later placed on their respective street locations. The plaques honor individuals who achieved national or international prominence in their lives. The others honored were Lucius “Luke” Benjamin Appling (Baseball Hall of Fame), Harry Webb Williamson (first NC Olympic athlete), Perley Albert “P.A.” Thomas (founded Thomas Car Works), James Emory “J.E.” Gibson (created the Fli-Back paddleball), Willis Howard Slane (President of Slane Hosier Mill), Myrtle Furr Hayworth Barthmaier (Chairman of the Board, Hayworth Industries) and Louis “Lou” Joseph Fisher (National AAU Chairman). 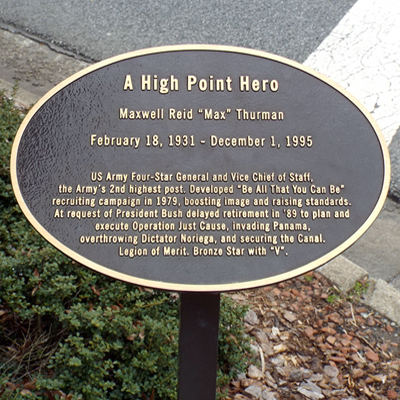 The plaque is located on a corner of South Main Street and High Avenue in downtown High Point. Memorials on a brick plaza (Memorial Park) across High Avenue include Veterans Memorial, Revolutionary War Patriots, POW/MIA plaque, African American Gold Star plaque, World War Two Honor Roll, WWI Doughboy statue. Across Main Street at the restored High Point Train depot is the Plank Road Foreman statue and “High Point” marker. The plaque stands at a crosswalk by bushes and a shady tree.